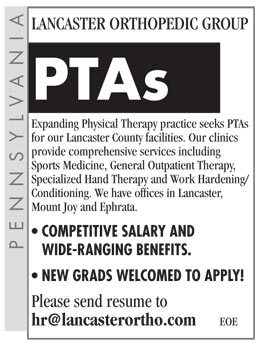 Expanding Physical Therapy practice seeks PTAs for our Lancaster County facilities. Our clinics provide comprehensive services including Sports Medicine, General Outpatient Therapy, Specialized Hand Therapy and Work Hardening/ Conditioning. We have offices in Lancaster, Mount Joy and Ephrata. • COMPETITIVE SALARY AND WIDE-RANGING BENEFITS. • NEW GRADS WELCOMED TO APPLY!